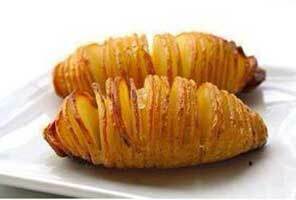 Cut very thin slices in potatoes almost all the way through, drizzle olive oil, butter, salt, garlic powder and pepper over the top, all while separating the slices with your finger tips. 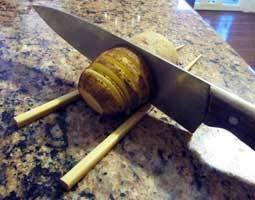 You can place a chopstick along either side of the potato to avoid slicing the potato all the way through. Bake at 425° for 50-60 minutes.